What had happened? Was there a fire? Vineti the Chocolate Aisha looked around the rest of the room, but everything else was normal. She could have sworn something had been burning, and there was ash on her bedcovers. She slid out of bed and looked in the mirror above her dresser; she looked fine, although she was a bit clammy. I am getting sick, she told herself firmly. Still… it wouldn’t hurt to go downstairs. Maybe someone had burnt something in the kitchen. We all love Granny Hopbobbin! She has such a kind and generous heart, always thinking of the less fortunate Neopians. She has successfully organized two charity drives now; one for Christmas toys and one for school tools. When both of these site events came to pass, I noticed an incredible amount of inflation in the Shop Wizard. That was great to see, not because it was more expensive to help others, but because it meant that everyone was doing their best to pitch in. 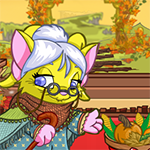 We thrive on the amazing opportunities that she gives us to help those poor Neopets in need. I’m sure that many of you wish we had events like this year-round. I certainly do! For those of you who love charity, I have some terrific news for you! Charity Corner doesn’t have to be the end of your charitable contributions to Neopian society! There are so many great things that you can do out there! Do you consider yourself a true Neopian? The selection criteria for this have varied over the years and can often be broken down further depending on a user’s individual interests. For example if you are an avatar collector it used to be the ‘Big Three’ that made you feel like you finally belonged but now getting a Top 50 position might be your goal. In my opinion it is not your achievements that make you a Neopian but your mistakes and failures and how you learn from them. We can’t all be well known or fantastic at games or collecting avatars or in the Battledome. But we can all commiserate together when things go wrong. If you still keep coming back to this site despite all the disasters and upsets you truly can consider yourself a Neopian. In this article I am going to cover what I consider the three main types of mistake and misfortune that will befall most Neopians at some point, with examples of each. In celebration of Eyrie Day, I have compiled an alphabetic list containing everything there is to know about this wonderful species. From colours to wearables and from characteristics to famous Eyries, this article brings the wonderful Eyrie into the spotlight. S "He's already read this one," Cleo said, setting the small hardcover copy of Courgette Farming down on the table before plucking out the teabag from her mug. The Vandagyre inspected the satchel's tag for a moment before tossing it into the wastebasket. "Drat. I was hoping he hadn’t approached a read this dry," Jamie sighed with a wry smile. He picked up Courgette Farming and flipped it over to look over the back cover's synopsis. He waved the book at Cleo. "Any chance you're looking to start a hobby in gardening?" Cleo shrugged and laughed, accepting the book that had already been rejected twice. "I'll save you the trip to the Money Tree and see if I can become Neopia's next major courgette farmer. Porter didn’t seem too enthused when he was going through this one." Without a doubt, Porter always kept a few spare books in his rucksack whenever he was out and about, just in case he were to finish one. And when he was at home, a book would never be too far out of reach. The auction house echoed with life, its high stone walls and wood floors reverberating with the sounds of arguing people. Auctioneers shouted over one another as lots rose in price and bidding times ran out. Amongst all the chaos stood a scruffy yellow Yurble, seemingly oblivious to the activity around him. In one paw he absently fingered a bag full of Neopoints, and he stared longingly at something on one of the long wooden auction tables. A heavyset blue Scorchio wearing a rather bright red and green visor and matching vest approached from the other side of the table. “Can I help you sonny?” he asked jovially. The Yurble looked up, startled out of his reverie, “Oh, no, thank you, I'm just looking.” His eyes wandered back to the baby paint brush sitting on the table in front of him, and he looked at the high price tag sadly. Suddenly a voice, barely heard over the noise in the hall, called his name. “Timmett! Come on, we're leaving!” Sighing, Timmett turned and headed in the direction of the voice. A tall, thinly built blonde woman, surrounded by three other pets, stood waiting in front of the large oak doors. “Come on Tim,” she said kindly, resting a hand on his head as she guided the four pets out of the auction house and into the bright sunlight. Most Neopets are created by caring, sweet owners who groom them and take them to Neoschool. A few others are adopted at a young age and raised by their kind new family. Less fortunate ones are sent to the Lab Ray, but end up having fun there with unexpected changes. However, our story is about one of the very few Neopets who were not raised by a loving family; instead, he was born in the Case 15-A of Laboratory #8 and his homeland was the Virtupets Research Centre. His name was Experiment GR-12. He was not the only one there, though; many other Neopets and strange creatures also lived at the Research Centre. GR-12 was a Grundo, created as the successful result of a series of experiments with the sole purpose of having a Neopet who would be able to revive dead plants. GR-12 never knew why he had been given such powers and to which purpose would they serve in the future. Indeed, it is always unclear what Sloth’s next plan will be. For the research facility was run and funded by no one other than the infamous Dr. Frank Sloth. The blue Kacheek finished the last sentence of the letter, dipping the quill into the ink one more time to sign her name in a flourish. Next to her, Avis, a white Weewoo, dozed in a roomy bird cage, her head tucked under her wing. Halfcastle Forge was that most curious of border towns. Neither here, nor there, and certainly of no real importance. Not quite in the Endless Plains. Certainly not part of the Haunted Woods. And not on a major trade route. The town, if you could even call it a town, had only one real claim to fame - being on the Demonica River. What is with that guy?! Fear me not. Repetition. Those three words appear again. They hang in the balance between sanity and slavery of the mind. To fear something is to believe that it has power over you.